Exceed 6-Way™ by By Med-Vet Pharmaceuticals offers COMPLETE Joint, Digestive, Blood, Hoof, Gastric support for your horse! Med-Vet Pharmaceuticals (MVP) has been providing horse owners of all disciplines quality equine health and nutritional products since 1972 - Over 4 decades! Quality products, competitive pricing and outstanding service cornerstone's our goal for "100 % Customer Satisfaction!" While MVP offers a wide variety of products that can be given to any horse, we specialize in supplements for performance horse. MVP supplements can assist with a variety of different functions related to your horse’s health—from joint support to calming supplements; gastric support, and everything in between. Whatever extra nutrition your horse may need, MVP has the product to aid in that extra support. Many customers love how quickly they’ve seen improvements and experienced a difference in their horse.! Is It True That Med Vet Pharmaceuticals Is An Audited Member of the NASC (National Animal Supplement Council)? Looking For A COMPLETE Supplement - Exceed 6 Way™ Is The Answer! Your horse is an athlete. And just like any athlete, you want to ensure he is strong enough to take on even the toughest challenges. 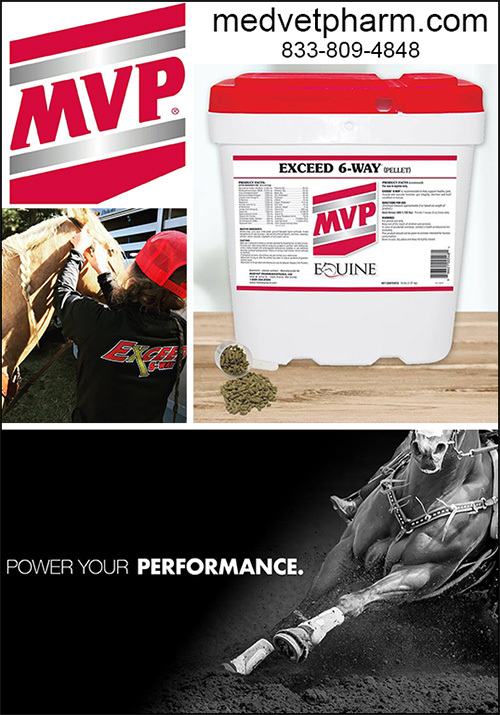 Help your horse work and train his very best with MVP Exceed 6-Way™. MVP’s Exceed 6-Way™ helps support every aspect of your horse’s health and performance by providing high levels of key ingredients for multi-level support in the following areas: Joints, Gastric Support; Muscle; Hoof, Hair Coat and Digestion. Professionally endorsed: Pete Oen; Martha Josey; Sharin Hall; Dena Kirkpatrick; Stevi Hillman, Rock Hedlund, Cullen Chartier and many more MVP Team Members! Experience the Difference with Exceed 6-Way™! Exceed 6 Way™-- Your Horse's Complete Answer To Overall Health! What Do Horse Owners SAY About Exceed 6-Way™? I couldn't be more impressed! I was struggling with keeping my mare sound and fluid, we?d tried everything.. was about ready to give up when I was told to try MVP Exceed 6 way.. 60 days later.. my mare was cleared sound. She?s been on the product for 5 months now and is back running and clocking in the 1D! I couldn?t be more impressed, MVP will always have my business. I?m so thankful. My barrel horse has been on 6-Way for over 6 months now! The change in her is unbelievable!! She is a totally different horse!! We were running in the 3D/4D prior to MVP, and now with the help of Exceed 6-way, we are in the 2D!! From her demeanor to her new shiny coat to everything in between, the benefits we have seen from MVP have been amazing!!! I will never use any other supplement ever again!! I am proud to have a horse that feels better than ever and is able to perform at her very best in the barrel arena! It is all due to MVP. My mare and I cannot thank MVP enough. We never leave home without our MVP products. Thank you, thank you, thank you!!! You have changed our barrel racing career forever. I have been using the exceed MVP 6-way for the last couple months for a mare that has long term joint issues and is hard to keep sound. I have major had major improvements and we are able to ride her every week without her being lame. also I have noticed a huge change in her coat. very shiny and soft. I would recommend this product to anyone. Running better than they ever have! I can not thank MVP enough for the best supplement on the market. The exceed 6 way has my daughters barrel horses running better than they ever have. Using MVP my daughter was able to win a saddle and two buckles last season. Here’s to a new season with the best supplement on the market! Thanks MVP! What If I Wanted To Add GastroPlex™ For Ulcers, Is That OK? Yes, GastroPlex™ ,in either the paste or pellets, may be safely added to Exceed 6 Way™ for specific concerns such as gastric support, a without concerns of overlap. Order Your MVP Products Today! No one outperforms MVP! MVP is carried by most distributors that you will find, in your own catalogs. United Vet Equine, ValleyVet, Smart Pak Equine, and more carrying many MVP products. Just so you know, you can find the entire line of MVP products at United Vet Equine.